Oh good. I am glad it has arrived, Sheila. Enjoy playing. I have put an envelope in the post to you today Kath. I have put an ordinary 2nd class stamp on it as I think it meets the criteria for this. If you should need to pay any extra, please let me know and i will reimburse you. I haven't heard from Hazel. I hope everything is ok. Sorry, Barbara, I meant to tell you - I put yours in the post yesterday first class, so, depending on the efficiency of RM, you should get it today. Postie's just been - nothing received here yet (which is probably just as well otherwise I could easily get sidetracked and not get on with other things I need to do!). Yes it did come today. Some lovely stuff thanks Hazel. I left it at home really sorry, I have left it in the hall this time. I shall watch for the postman, Barbara. Thank you. Thank you Barbara, my crafty envelope arrived today. I didn't need to pay anything on it, in fact it wasn't franked! I shall have to put my thinking cap on now. Thank you for my goodies. Thanks, Carolyn, mine arrived today - lovely selection - love the colours. Please can you tell me what ink you used to stamp with so I know whether to use markers or pencils. sorry - I forgot - they are just in ranger archival - that is all I have I hope that is OK. I glad you like the colour combo - I like it too - but didn't have tons of it in different things. 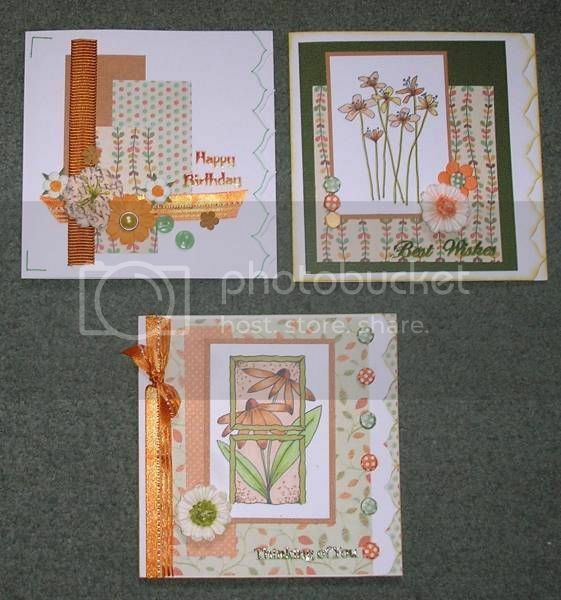 I made 3 cards yesterday with my goodies from Hazel. I tried to include at least one thing from all the different stuff sent. I still have lots left. They are lovely Barbara. Looks like you had a lovely selection. Very nice cards Barbara; it looks like Hazel sent you a little treasure chest of component parts.